Ak Bars wrote its name into the history books with its third Gagarin Cup triumph. Fittingly, in this 10th anniversary season, the biggest prize went back to the first time to lift the cup, while the Kazan team’s success puts out in front of the competition. No other team has won it all more than twice; head coach Zinetula Bilyaletdinov claimed his third triumph to move level with Oleg Znarok (Dynamo and SKA) as the most successful KHL coach. More impressive still, Danis Zaripov collects his fifth prize. The forward was part of Kazan’s first two title-winning rosters, then picked up two more titles at Metallurg Magnitogorsk before returning to Ak Bars this season for yet another success. Statistically, simply having him at your club gives you a 50% chance of winning the big prize. But the plaudits in this decisive game belonged to two men: goalie Emil Garipov and forward Rob Klinkhammer. Garipov’s defiant display in the face of intense CSKA pressure kept his team in with a chance; he made 33 saves for his second shut-out of this year’s playoffs. Klinkhammer’s clinical finish when a power play early in the third period gave Ak Bars a rare opportunity to exert some pressure of its own broke the deadlock and set Gagarin on his way back to Tatarstan. The goal came 66 seconds into the final frame. Ak Bars had finished the second period strongly, and Mikhail Pashnin’s penalty carried over the intermission. That set the stage for the home team, and the power play did not fluff its lines. Vasily Tokranov, Kazan’s most productive defenseman this season, exchanged passes with Anton Lander; the Swede slung the puck into the danger zone from the right circle and Klinkhammer got in front of Mat Robinson to put his stick down and deflect the disk past Lars Johansson. There was a moment of anxiety when CSKA appealed, believing the Canadian forward’s skate had strayed into Johansson’s crease, but the video confirmed that the goal was good. Cue delirium for most of the home crowd. Last time the Tatneft Arena hosted a Gagarin Cup Final Game Five, the home fans came more in hope than expectation. 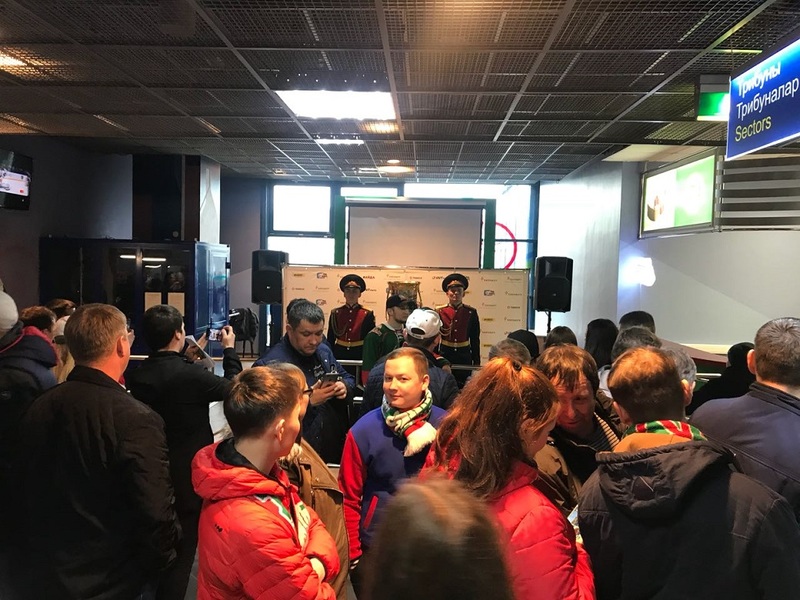 On that occasion, in 2015, Ak Bars trailed 1-3 in its series with SKA and, despite loud statements of defiance before the face-off, the Petersburg club romped to a 6-1 victory on the day to lift the cup for the first time. Today, though, things were very different. A sell-out 8,890 crowd came in anticipation of seeing their heroes crowned Gagarin Cup Winner for the third time in 10 seasons. However, CSKA had no intention of giving up its dream of landing a first ever KHL triumph and the stage was set for another tense encounter in a series where goals have been hard to come by. The opening stanza saw the Army Men once again seek to strangle the Kazan offense. 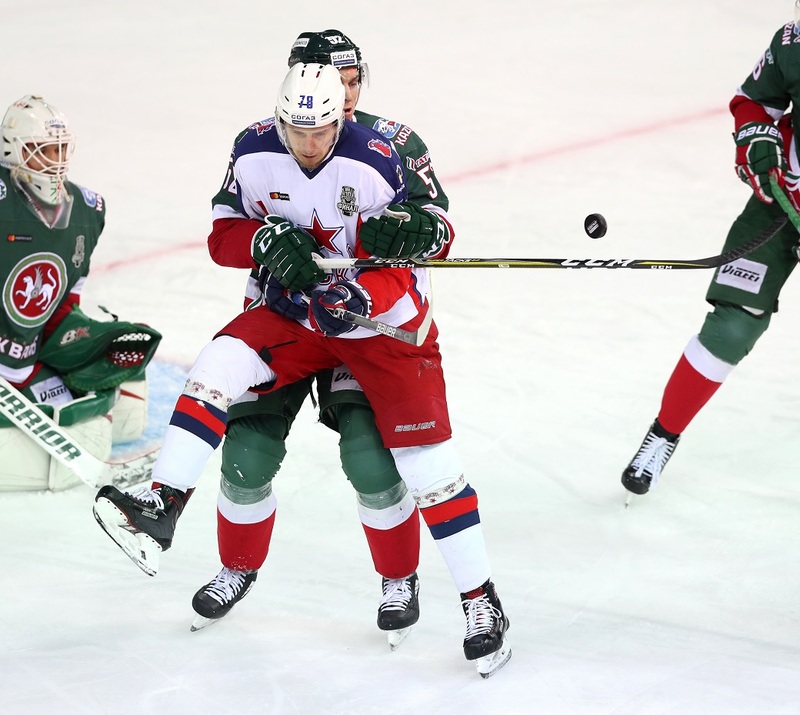 Ak Bars mustered just three shots on Johansson’s net – the Swede preferred to Ilya Sorokin, just as he was the for the crucial games in the Western Conference final against SKA. However, the home team has been solid at the back throughout this series and did a good job of keeping CSKA on the outside despite ceding much of the possession. Much of Ak Bars’ success thus far has stemmed from its penalty kill: in Friday’s 3-1 win in Moscow, the team survived five CSKA power plays, and it blanked the Army Men once again late in the first period when Albert Yarullin was sent to the box. It wasn’t quite a flawless PK – Mikhail Grigorenko had a good look at Emil Garipov along the way – but it was good enough to ensure the game was goalless at the first intermission. The second period followed a similar pattern, right down to Yarullin spending time in the box and CSKA failing to capitalize. The visitor had its moments but could not make them count: Sergei Andronov and Kirill Petrov whipped up a storm on the slot but could not force the puck home; Mikhail Glukhov reacted smartly to take Andrei Svetlakov’s enticing feed away from the lurking Andrei Kuzmenko. The final moments of the second period finally saw Ak Bars bring its offense to the party. Zaripov had a shooting chance, Alexander Burmistrov looked to test Johansson and a delayed penalty against Pashnin gave the home team the chance to begin the third period in a similar vein and Klinkhammer took advantage. The Ak Bars goal put the game into a familiar situation: throughout this series, CSKA had generated more shots on Garipov’s net but found it hard to get the puck past the goaltender. The closing stages here were no exception. The Army Men wanted to get forward at every opportunity but found their pathways to goal barricaded by the green-jerseyed stalwarts of Kazan. Blocking seven shots to CSKA’s one in the final period summed up the difference: Ak Bars, as so often before, strangled the vitality out of the opposing offense, providing superb cover for Garipov to help him record his first shut-out of the cup final. For CSKA, defeated at this stage for the second time in three seasons, the wait for a trophy goes on. The most-titled club in the game has not lifted its country’s top prize since the Soviet era, a drought almost as long as its one-time dominance. But in Kazan the celebrations could begin in earnest – a worthy champion for the third time in 10 seasons.